The Rosemount 5408 non-contacting radar level transmitter uses enhanced technology and human centred design to deliver accurate, reliable measurements on both liquid and solid materials. Using two-wire FMCW technology the instrument deploys a continuous echo to maximise radar signal strength and produce a more robust and reliable measurement. Delivering ease of use at every touch point, the 5408 uses an intuitive software interface to guide the operator through installation, commissioning, proof-testing and maintenance. Safety certified to IEC 61508 for SIL 2 applications, the Rosemount 5408:SIS reduces cost of risk, increases efficiency and protects people and the environment. 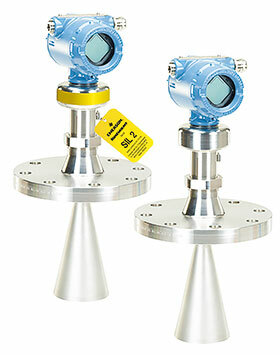 The 5408 and 5408:SIS are ideal for level measurements over a broad range of liquid and solids applications. The transmitters are virtually unaffected by changing density, temperature, pressure, media dielectric, pH, and viscosity. Furthermore, non-contacting radar level is ideal when internal tank obstructions are a limiting factor. Reactors: the 5408 is ideal for the most challenging applications, including reactors where there can be agitation, foaming, condensation as well as high temperatures and pressures. Open atmospheric applications: measures reliably in open applications, from short range sumps or ponds to long range dams. Bulk solids: the ideal solution for small to medium sized silos with rapid level changes. The narrow beam avoids internal obstructions while still keeping good level measurement. Storage and buffer tanks: provides accurate and reliable level measurement for both metallic and non-metallic vessels containing almost any liquid (e.g. oil, gas condensate, water, chemicals). Blenders and mixers: withstands the rigors of blenders and mixing tanks. Easy to install and commission, it is also unaffected by virtually any fluid property change. Still pipe and chamber installations: an excellent choice for level measurement in tanks with still pipes. It may also be used in chambers, but guided wave radar is generally the best fit for these applications. Safety applications: the R5408:SIS is the ideal choice for safety functions such as overfill prevention, level deviation monitoring or dry-run prevention.